Earlier this year, Tencent-owned WeChat, a mobile messaging app with more than 300 million users, came under fire for censoring ‘sensitive’ topics that its users were discussing. Now, Line, a rival app developed in Japan which has 150 million users, is the next in line to pal up to the Chinese government and restrict the use of certain phrases on its dedicated China service: Lianwo. In addition to the code, @hirakujira gained access to Lianwo servers and obtained a list of 150 ‘bad words’ (in this pastebin note) that the company will monitor for. Words on the list include references to the Tiananmen Square massacre (a phrase that previously got Foursquare blocked in China), recently ousted Prime Minister Wen Jiabao and his family wealth (which was subject to a NY Times exposé), ‘criminality in the communist party’, ‘Jasmine Revolution‘ and other terms which are routinely deleted when posted to Chinese Web services like Sina Weibo. The censorship feature is not currently activated, but, it has been suggested, that Line could monitor the conversations of its users worldwide, that’s despite it only blocking language used in China. However, representatives at Line have said this is untrue, since its filtering system affects only Lianwo users that are based in Mainland China. TNW carried out a range of tests and was able to receive a number of phrases from the block list without a problem — in both Chinese and the English equivalent. The discovery of the censorship feature and list of terms is a clear sign that Line is focusing on growth in China. Western Internet services like Facebook and Twitter are blocked in the country, while domestic Web companies are subject to censorship and punishment when they fail to manage their users. Last year, Sina Weibo was made an example of when its commenting system shut down for three days after it was adjudged to have been slow in responding to coup speculation that emerged on its Twitter-like service. What’s particularly concerning for those in China, is that Line asks users to verify their telephone number in order to install the app. The fact that Lianwo then monitors their user chat logs for sensitive words, will raise alarm given the potential repercussions should that data fall into government hands. Line has around 45 million registered users in Japan, but it has passed 150 million registrations worldwide thanks to particularly fast growth in Southeast Asia, Spain and Latin America. The ambitious company is also targeting China and the US, and is thought to be devoting significant resources to both markets. Despite WeChat’s dominance in China — all but 40 million of the service’s 300 million-plus users are on its home turf — Line launched there in December 2012. While it is the underdog in the battle, its lack of censorship was one advantage that it had over WeChat from a Chinese user’s perspective. At least until this discovery was made. It isn’t clear if the creation of this feature is a response to a request from the Chinese government, or whether Line made the change on its own. The dilemma between following legal regulation from authorities or choosing to operate from outside of China is one that many companies juggle when committing to having a business in the country. 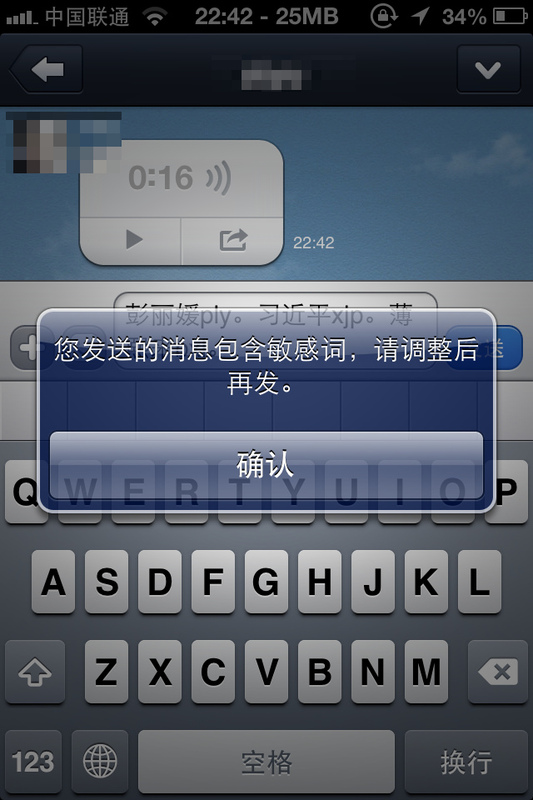 Line could opt not to censor Chinese words, but then it runs the risk of being blocked by the government. Twitter, Facebook and Google are among those that have refused to kowtow to censorship, but many others have relented in exchange for the chance to gain a foothold in the country’s vast and fast-growing Internet space. Tencent apologized for its WeChat censorship, which affected users worldwide, but referred to the issue only as “a technical glitch” that meant “a small number of WeChat international users were not able to send certain messages”. Despite that, the issue was enough for many to suggest that it would impact WeChat’s global growth potential. Quartz went so far as to say that WeChat had “messed up its best chance of beating Facebook”. While Line’s censorship is limited to China, it remains to be seen how this issue will affect its ambitious goal of becoming a truly global service and widening its income base worldwide. The company recorded $58 million in revenue during Q1 2013, but a whopping 80 percent came from Japan highlighting that it is still to turn a global user base into global revenue streams. Line has declined to comment officially. However, the company did point out that its service does not monitor the conversations of all users worldwide. That, we are told, is limited to users of the Lianwo app in Mainland China. Thanks to our anonymous tipster and Richard Lee for helping with Chinese-English translations.